You are here: Home » Learn & Live the Faith » Catechesis » Who Wouldn’t Want This? Has Lent got you feeling grumpy? Deprived? Hungry? Has politics got you acting like a real bear? Are you snapping at people? Is the long wait for the first buds of springtime transforming you into someone from whom people walk away? Your heart, soul, body, and mind all need something. But what? If only The Church had something, something you could access daily if you really wanted to, that yielded miraculous graces! If only. . . The principal fruit of receiving the Eucharist in Holy Communion is an intimate union with Christ Jesus. Growth in Christian life needs the nourishment of Eucharistic Communion, the bread for our pilgrimage until the moment of death. 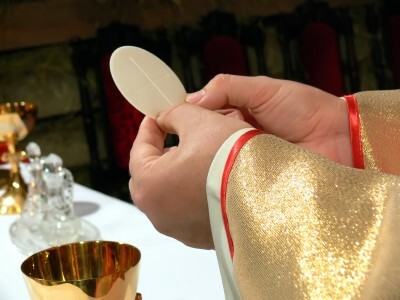 As bodily nourishment restores lost strength, so the Eucharist strengthens our charity, which tends to be weakened in daily life, and this living charity wipes away venial sins. By giving Himself to us Christ enables us to break our disordered attachments and root ourselves in Him. The more we share the life of Christ and progress in His friendship, the more difficult it is to break away from Him by mortal sin. The Eucharist commits us to the poor. There is no surer pledge or clearer sign of this great hope in the new heavens and the new earth in which righteousness dwells than the Eucharist. We break the one bread that provides the medicine of immortality, the antidote for death, and the food that makes us live forever in Jesus Christ. Friends, if you have fallen away from The Church, if you have spotty Mass participation, if you do not believe in The Real Presence, if you are a Protestant, if you are an agnostic, if you are an atheist, if you are able to read these words, I beseech you to consider availing yourself of this Heavenly gift. You are reading this for a reason. Maybe it’s for you. Or maybe it’s to pass on to a lukewarm friend or a family member who is no longer a member of the pre-denominational, Jesus-origninated, blessed and daily guided Catholic Church. Soon enough it will be Easter Sunday, and new life will be shattering the walls of death. Taste and see what this upcoming Passion week is all about. Begin to imagine how close you can be to Jesus Christ, the Son of the Father, the Living God — so close that He is literally right there in front of you and entering your body. It’s a weighty thing, and it’s a miracle, and it’s here for you every single day, in every Catholic Church around the entire world. Amen?